RSMSSB Recruitment 2019 - Apply Online for 28 Junior Scientific Assistant Posts in State Law Science Laboratory Department, Rajasthan on Direct Recruitment. 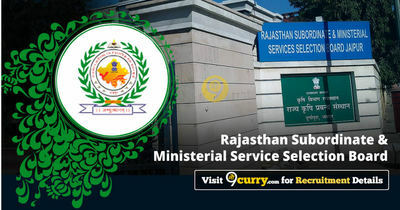 Online Applications are invited by Rajasthan Subordinate and Ministerial Service Selection Board from 20 Jan 2019 to 19 Feb 2019 till 12 Midnight for 28 vacancies. 03 B.Sc. Degree in relevant discipline. Eligible candidates may apply online at RSMSSB's website (direct link is given below) from 20 Jan 2019 to 19 Feb 2019 till 12 Midnight.